A former Norwich driver has identified the remote ‘mystery’ location of a 50-year-old photograph published in last month’s Heritage Railway that showed two diesel locomotives at a rural outpost – and he has even identified the driver. 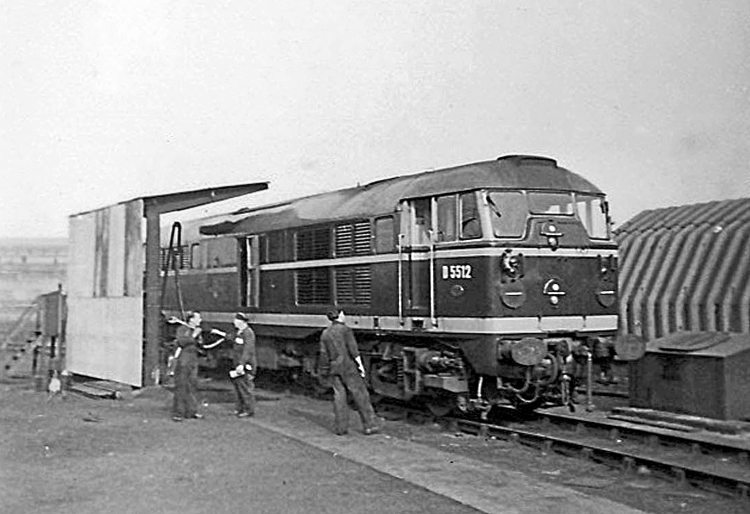 Stablemates | In a photograph taken by Heritage Railway’s Geoff Courtney, then a 15-year-old trainspotter, D5512 is the centre of attention at Stratford (30A) on March 17, 1959. The photograph, from the Transport Treasury collection, accompanied a report of the recent purchase by Mangapps Railway Museum of two Network Rail Class 31diesels, one of which, No. 5523, is seen at the head of a freight train. Mangapps’ owner John Jolly thought the image may be in the area of County School station between Dereham and Fakenham in Norfolk, and his speculation was a mere10 miles out. It is indeed in Norfolk, but former Norwich driver Chris Pearson, who lives in Dereham, has identified it as Lenwade, a former Midland and Great Northern Joint station on the Melton Constable to Norwich line that was opened by the Lynn & Fakenham Railway in 1882 and closed by BR to passengers in March 1959 and to freight in 1983. Although there are no buildings in the photograph to make identification easy, Chris says it is definitely Lenwade, and the load being carried by the Class 31 is beams from a local concrete products factory that was a central part of the village at the time due to sand and gravel extraction in the area.